Yesterday Skype announced the availability of Skype for iOS 4.1, an upgrade that introduces photo sharing as well as longer iPhone/iPad battery life when running Skype. This of course triggered some “deep thinking” as to why Skype took so long to include photo sharing as well as why it was not available on Skype for Windows/Mac previously. Dan York has gone into detail on how this photo sharing works as well as commentary on whether it impacts other applications that include photo sharing such as Instagram, Facebook and Google+. Another concern is the legacy user experience with the battery life impact of leaving Skype running. That, to me, will be the key for the usage and adoption of this photo sharing. I need to be comfortable leaving Skype running on my iOS devices – and so do my recipients. If we all get to the point where Skype is just “always on” on our iOS (and Android) devices… then yes, we might start using this as a way to share photos. Bottom line is that he sees this feature being of more use provided battery life is not impacted while Skype is open, especially on the iPhone. During an initial overnight period my iPad battery dropped from 56% to 51% with Skype running in the background. However, when I first learned of this announcement and saw some commentary, it reminded me of an old saying about web browsers being included in Windows – it’s a feature! (as opposed to an application). In practice Skype for iOS 4.1 finally brings an initial implementation of file sharing to Skype for iOS – a feature that has been available since last winter on Skype for Android. But there are some significant differences. 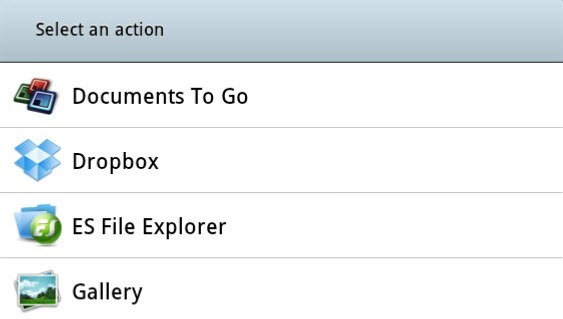 While the first two are self-explanatory, ES File Explorer is one of the most popular file managers on Android while Gallery is Android’s native photo viewing application. Skype has essentially made accessing a file for sharing somewhat easier by accessing both native-device and cloud-based file manager applications. And, most importantly, the ability to share a file is simply as a feature that complements a Skype conversation, whether chat, voice or video. For iOS devices with a camera, there are initially two choices, as Dan shows: Choose Existing or Take Photo (using the camera on the device). Note that Skype for Android does not offer a choice to “Take Photos” under its “Send File” feature. But amongst the “Existing” photos are those that come from iPhoto on my MacBook. 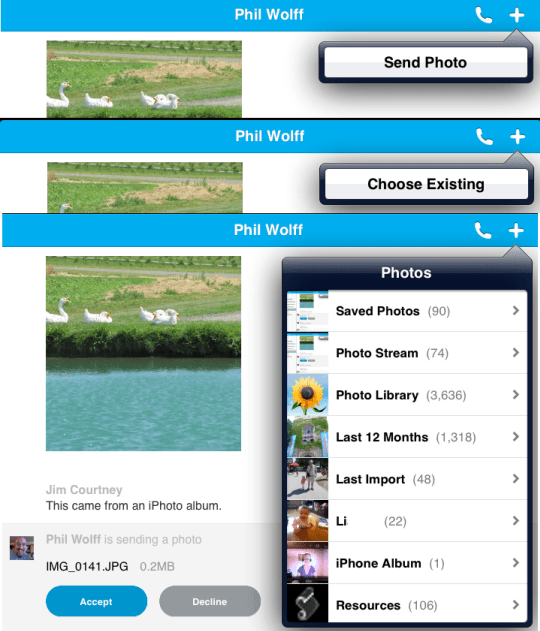 Also worth noting is that it’s a feature that allows photo sharing independent of file size. This is a feature that overcomes limitations of email and messaging services. In this example I sent Phil a photo from my iPad but of course, as indicated above, it is not on my PC; on the other hand I was able to receive, on my Windows PC, the photo that Phil sent to me from his iPad. I also noticed that not only does Skype load faster but when you access a previous conversation that needs updating on a new login, these updates come up much more rapidly, even with large Group Chat sessions containing over 100 “new” messages. This was previously a significant user experience issue. Bottom line: Photo sharing on iOS devices is simply bringing an initial implementation of a legacy feature on Skype for Windows/Mac, namely, file sharing. Photo sharing is a social feature of many social networking applications, such as Facebook. Twitter, Four Square and Google+. On Skype for iOS 4.1 it is simply a conversation enhancement to real time social networking. In a similar vein, recall that voice and video calling on Facebook are simply real time social networking features within Facebook. When looking at an announcement from Skype I am always asking: “How does this enhance real time Skype conversations?”. Should Skype ever lose that focus, then they will start to encounter dysfunctional issues. We are already seeing a similar situation with Facebook’s drifting stock price as they try to figure out how to enhance their social networking activities. As to who will use this feature: over the past year I have found several acquaintances who take the iPad as their sole “intelligent” device while traveling. And they make heavy use of Skype (usually at WiFi access points to avoid roaming charges) to call back home. Now they can also share photos during those calls, even when the called party is using Skype for Windows/Mac. Let’s face it – exchanging photos is a natural vanity exercise – especially when it comes to grandparents! One final question; As with Skype for Android, can we expect to see file sharing on iOS devices expanded to include, say, Dropbox? According to a Skype spokesperson, Apple does not allow an app publisher to have different apps interact with each other on iOS whereas Android does. However, Dropbox does have its own iOS SDK. PamFax for iOS provides access to Dropbox (via the SDK, not via the Dropbox application) for two purposes: to select a Dropbox file for faxing and to receive faxes in a Dropbox folder. Once I had tested this feature I dropped my dedicated Bell Canada fax line. Can Skype take advantage of this SDK?